Most of my photos could be described as candid, and that’s my preferred shooting style. I hate stiff poses and cheesy smiles and aim to capture the true essence of the day without meddling too much. Sure, I might ask you to look in a certain direction at times during the portrait session, but any posing is kept to a minimal. I rather use direction, giving you topics to talk about, places to walk to and explore. And sometimes you get to hug, cause you know, you two probably already like doing that. Other than that I’m just there to follow along and document your day as it unfolds. Oh no, of course not! I love travelling, whether close or far away. In fact, I make the most of my profession and am usually heading back to Sweden every year during June – July, to shoot weddings there and around Europe + to hang out with friends and family. If you didn’t guess it already, I am Swedish. 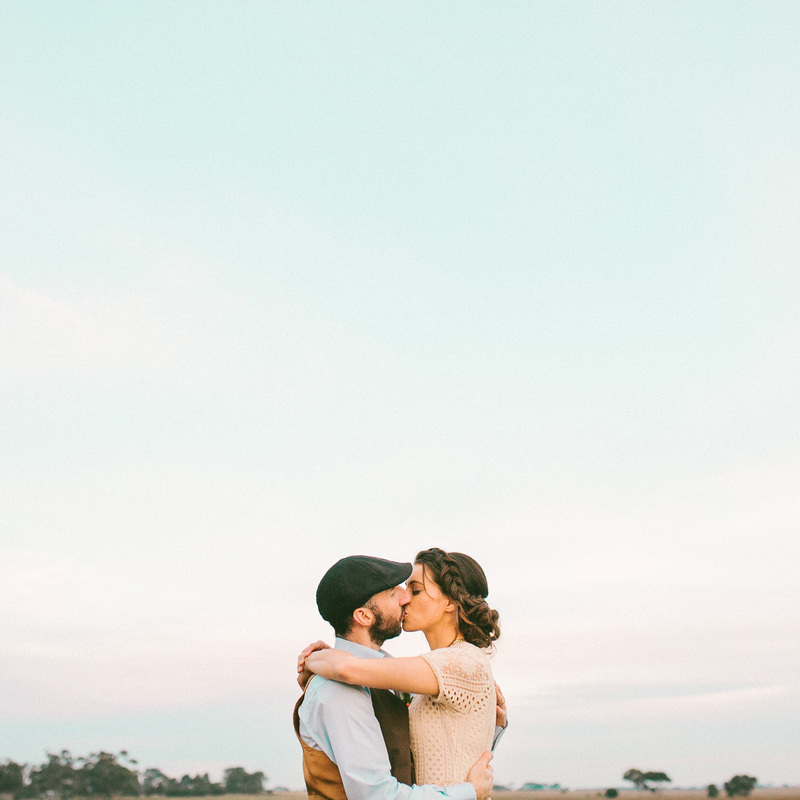 If you are getting hitched further than 50km outside of Melbourne (or the equivalent of where I’m based in Sweden) I do charge a small travel fee for Victoria, and there’s a flat fee of $500 for interstate Australian weddings. Please enquire for a quote on international weddings. My pricing start from $3,950 for an all digital 9 hour package. I do offer a shorter package for elopements and small weddings, as well as additional hours for all those massively long shindigs. Drop me a line at hello@goldandgrit.com.au and I’ll send over a fancy PDF with all the deets. The exact number differs from every event, but as a general rule you can expect around 90 photos per hour of shooting. Yes I do. I think all photos should look the best they possibly could, which means I review and edit them individually to make sure they’re donning their finest before I deliver them to you. Do you meet us before the wedding? Of course I do! I want to make sure I know you two before the wedding. Usually I’ll meet you two just after your first enquiry to see if we click. If you book me, we’ll meet again before the wedding to suss out all the details for the big day. When do we need to book you? As soon as possible is generally the best way to go. Some months (and days!) are more popular than others (hint: November – April), and to avoid disappointment it’s best to book sooner rather than later. I’m usually booked up about 8 months in advance, but keep in mind though that sometimes I do happen to have the odd weekend off, so I might be available even though your wedding day isn’t too far off. Just check with me and I’ll let you know my availability straight away! Do you hold wedding days? I do, but only once I have received a signed contract + a deposit of a 30% of the total investment. So, it’s the wedding day. What can I expect from you? I like to be a ninja on the wedding day. Generally I prefer to stay in the background as to not interfere with the interactions and the stuff that’s going on. I’m helpful and easy, and quick to make a (unfortunately probably quite bad) joke, which is oh-so-important when dealing with big bridal parties. I do become a wee bit bossy when it comes to the family and the group photos, just to make sure we get through them in a jiffy. How much time do I need to set off for photos? This differs a bit depending on what’s important to you and the schedule of the day. Usually I talk the scheduling through with you as soon as I’m booked and leave you with a handy document that outlines my tips for planning your day and timeline. One thing to keep in mind is when sunset happens on your wedding day, as golden hour (i.e. the hour before the sun sets) offers some exquisite light to work with. I’m also a keen supporter of doing a ‘first look’ and the bridal portraits before the wedding ceremony. That way you’ll get some quiet time together, the makeup and hair will still look rad plus (and this is the best part) you can go hang out with friends and family straight after getting married! After all, they’re the ones you’ll want to spend time with on your wedding day. And your new spouse, of course! What happens if it rains on the big day? Uh oh, but don’t worry! I always location scout before the wedding day so I’ll have one or two backup options in mind. If not, there’s always umbrellas. And in fact, overcast rainy weather is gorgeous for pictures. It might not be enjoyable to be in, but people look smashing hanging out in rain! Yes I sure do! I love doing them with my wedding couples as it’s the perfect way for us to get to know each other before your wedding. It usually also makes you much more relaxed in front of the camera, along with getting some killer shots. My sessions are 2 hours and you’ll be getting around 75-100 images out of them. Check out more info here!